This contradicts most of the witnesses? FERGUSON, Mo. — Michael Brown, the unarmed black teenager who was killed by a police officer, sparking protests around the nation, was shot at least six times, including twice in the head, a preliminary private autopsy performed on Sunday found. One of the bullets entered the top of Mr. Brown’s skull, suggesting his head was bent forward when it struck him and caused a fatal injury, according to Dr. Michael M. Baden, the former chief medical examiner for the City of New York, who flew to Missouri on Sunday at the family’s request to conduct the separate autopsy. It was likely the last of bullets to hit him, he said. If you follow the link and read the whole story, you will find they only recovered three of the six bullets. So, why no exit wounds on brown's backside? 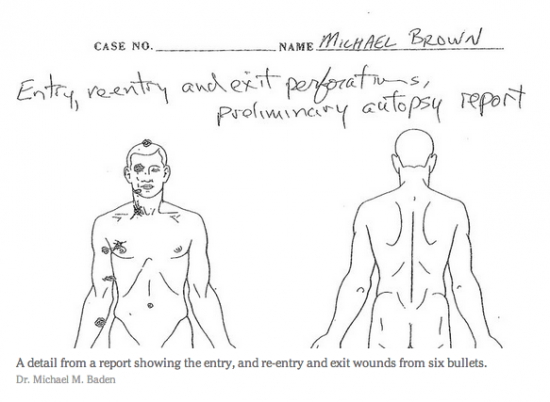 The if the x marks are exit wounds, Brown was shot in the top of the head as he, or his head, was bent down? That would likely have been the fatal shot. Note: It looks likely the shot to the lower arm was from when Brown was fleeing or holding his hands up in the air. The palm would have to have been turned toward the officer. Who runs to attack someone with their hands palm forward? If you are running away, your palms and forearms could be turned sideways or backward. The same is true if you hold your hands over your head. Note: I originally called this the first autopsy. It is the first autopsy released and seems to be the one arranged by the family. The police are still sitting on theirs for some unknown reason. Note: I think it is unlikely this wound was from when Brown struggled with the officer at the car. Brown was wearing a short sleeve T-shirt and had no gunpowder residue on his arm. Note: Some claim the bullet wound to the top of the head proves Mr. Brown was leaned forward and charging the officer. For there to be no exit would on the back of the head, I would think Brown had to be severely leaned forward; perhaps at a 90 degree angle. Mr. Brown weighed almost 300 pounds. He would have fell flat on his face if he tried to run in that position. Michael Brown was shot in the top of the head as he was falling down or after he was already down. Note: So, to believe this story, you have to think the after having the cop shot at him in or beside the car (the weapon discharged according to police), Brown ran away and then, unarmed, decided to rush the cop from a distance instead of keeping on running. While rushing the cop, Brown was shot in the palm side of his right forearm. So, Brown had his palm turned toward the cop at some time. Furthermore, you have to believe Brown kept rushing the cop after being shot at least 5 times. Ten, Brown leaned forward to an almost 90 deg. angle while still rushing the cop in a threatening manner and, then, received the 5th shot and fatal shot to the top of his head. Uh, OK.